I used the Simply Scrappin Kit Pinwheels on Parade and a brad from the Antique line. A very easy card that would work nicely for a masculine or kid's card occasion and you can add a sentiment to the banner at the bottom. 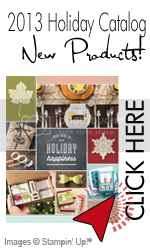 All supplies can be purchased from my Stampin' Up! website. So now it is your turn to visit our new Paper Craft Crew Challenge blog. Pam will guide you through some of the directions for this week's challenge and tell you a little about who we are. We look forward to you visiting us each week and participating in these fun sketches.